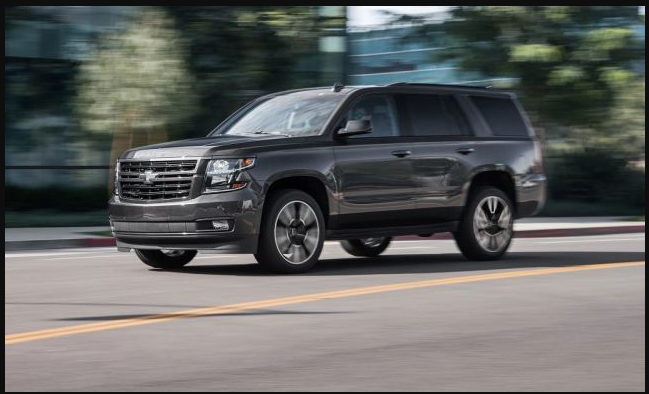 One of our spy photographers just caught a smattering of full-size GM SUVs out testing, including the Chevrolet Tahoe, Suburban and GMC Yukon. Previous spy photos of the next-generation of these big GM SUVs have revealed that GM is going with an independent rear suspension design, and these shots confirm the news once again with our best look at the hardware yet. Check them out from the rear, lined up like ducks in a row to see the beefy control arms down there. This will undoubtedly give the big SUVs a more compliant ride, and should bring it back into touch with the refinement from the Ford Expedition and Lincoln Navigator. The new bits we get to see with these shots are production headlights and taillights that are shaping up to look pretty neat. Most distinguishable are the GMC Yukon’s LED DRLs. These look a lot like the C-shaped LEDs outlining the headlights on the Sierra, but they have an extra LED strip on top of the C. The parts of the taillights that we can see look significantly different than that found on the Sierra, showing GM is planning on having a great deal of differentiation there. We can sort of see through the mesh covering the grille to what appears to be a classic horizontal bar style front opening. Chevy is predictably dialing the crazy LED strip design back for the Tahoe and Suburban. The parts that are lit up look a whole lot like the headlight fixtures on the 2019 Silverado. That truck uses a stack of lights with the actual headlights separated from the DRLs. We can see the same thing going on here, with the headlight up top and curved LED DRL strip sitting below. It’s tough to say if the designs are exactly alike, but we expect to see an extremely Silverado-esque look once all the camouflage comes off. Chevrolet’s taillight design differs from its donor truck like the GMC, showing off a curved, vertical series of LEDs out back. Once production lights start popping up like this, we know the vehicle is moving closer to its end game. A reveal sometime later this year could be in the cards for GM’s next batch of full-size SUVs. It certainly needs them quick, as Ford rockets ahead with increased Expedition production announced earlier this week.